Multi-venue inner city festival have become all the range in the past few years and why the devil not? Instead of wading through the mad of a Glastonbury or having to travel to the middle of rural nowhere, the likes of The Great Escape, Camden Crawl and Bushstock offer an increasingly tempting alternative to the traditional festival. More importantly, a collection of great bands will be descending on West London at Bushstock this Saturday. Run by the esteemed folk behind the Communion record label, Bushstock 2012 takes in four venues around the Shepherds Bush area, easily accessible by a vast array of public transport links. While the furthest distance between venues is no more than fifteen minutes walk, like all multi-venue festivals, if there are acts you wish to see later in the day then you must get down early and stay put. Having said that, we do enjoy traipsing between venues, so our suggestions below reflect a spread of artists across the different venues. Considering the Communion influence, it's hardly surprising that the line up is very much dominated by folk/acoustic acts but we're also highlighting a few of the artists from slightly different backgrounds. Many of them we've covered before, and often also already seen, so we're happy in the knowledge that they should thrill and excite you as much as they did when we went to see them. We first wrote about Alessi's Ark back in 2008, when the project was simply Alessi, and caught up with her again with her efforts on the new Young Colossus project, with Orlando from The Maccabees. Shamefully, we haven't caught her live yet but we're fully confident she is as magical as we suspect her to be. I'm not really sure we have anything left to say about Dan Smith and his BASTILLE outfit, who we've been religiously following since the end of 2010. We recently saw the band at the Camden Crawl, and once again witnessed their triumphant pop in action. Elena Tonra et al have been a firm FG favourite since early 2011, and with a new record deal under their belt (signing to 4AD), this will undoubtedly be the first of many festival headline slots. Raman FG claimed that "Daughter boasts one of the most stunning live vocal experiences so far this decade". One of our tips for 2011 but never quite coming to the boil, they nonetheless excited us live with their joyous indie-pop when we caught them at last year's Camden Crawl. We suspect little has changed since then. We were blown away by Lanterns On The Lake at The Great Escape 2011, and we have a good feeling that they're even better live now. Mixing folk-pop and post-rock to stunning effect. Another of the FG tips for 2011, it's been a while since we saw their majestic eighties soundscapes live. But we very much enjoyed their live efforts so can heartily recommend you explore their sounds at Bushstock. If it's been a while since we saw Let's Buy Happiness, then it's been eons since we saw Mystery Jets. Indeed, the last time we caught them may well have been when they still had Blaine Harrison in their line-up, a good five or more years ago. Since then, they've also lost Kai Fish, but we've heard fairly good things about latest album 'Radlands' and with a back catalogue of hits, they should be one of the big crowd-pleasers of the festival. We're only just starting to click with Pale Seas after a couple of our pals recommended them back when they were known as Netherlands. Dreamy folk, which should go down a treat with the Bushstock audience. At only 18 years old, Bournemouth's Rae Morris remains a raw prospect but on the basis of 'Don't Go', her performance could well be an eye-opener. Powerful vocals and restrained instrumentation remind us of the ubiquitous Adele when she first started out, and we hope that Rae shows the same kind of determination and longevity as the aforementioned artist. As we mentioned before, Bushstock is heavy on the folk/acoustic sounds, so when a band does something different then they undoubtedly stand out. Leicester's Silent Devices are one such band, combining ambient-pop, post-rock and Elbow-esque anthems. Hauntingly arresting. 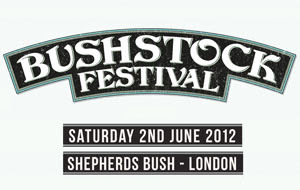 Find more info (including the full schedule) and buy tickets at bushstock.co.uk.